Weighty Matters: Movie Popcorn Just Got Worse! 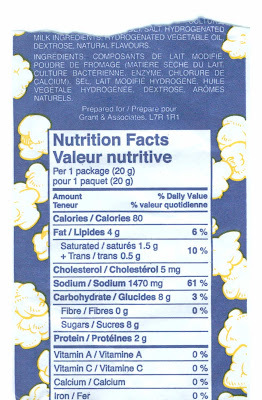 I think most people know that as far as nutrition goes, movie popcorn is killer. Even without butter, large movie popcorns can run you well over 1,200 calories. So how did movie popcorn get worse? Well at least at Cineplex now we're being offered free packets of "flavouring" to shake onto our popcorn. 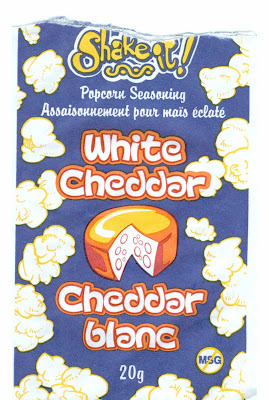 Having recently been at the movies my wife and I shared a small popcorn and we decided to try the white cheddar shaker. Turning it over pre-shake I was astounded to learn that basically it was a packet of flavoured salt - 1,470mg or roughly a day's worth. They're serving it to kids and seniors too - more than a day's worth.